The MPF MC Audio Interface is a custom audio Python extension library with features designed to support common pinball sound requirements. It is written on top of the SDL2, SDL_Mixer, and GStreamer libraries that are installed with Kivy which is required to run the MPF MC software (no additional installs necessary for the audio library). The SDL2 library (https://www.libsdl.org/) is responsible for all low-level communications with the system audio hardware. The user selects the basic audio interface settings: sample rate, output channels, and buffer size (defaults are provided). These settings are used to initialize the SDL2 library which then negotiates with the system audio hardware to create a connection that is as close to the desired settings as possible. The SDL2 library is responsible for creating the main audio thread and calling the main audio callback function at a fast enough rate to provide audio buffers to the hardware without any gaps in playback. It also provides the thread synchronization and protection utilized in the audio library through its mutex-related functions. The audio library also uses the SDL2 audio format conversion functions to convert between various low-level audio formats to communicate with the system sound hardware. SDL_Mixer (https://www.libsdl.org/projects/SDL_mixer/) is an add-on library for SDL2 that provides basic audio mixing, sound loading and playback, and sound streaming capabilities. The MPF MC audio interface does not use the mixing features of SDL_Mixer. Instead, it only utilizes the sound file loading functions of the library. GStreamer (https://gstreamer.freedesktop.org/) is an open source, cross-platform pipeline-based multimedia framework that links together a wide variety of media-handling components (including simple audio playback, audio and video playback, recording, streaming and editing) to complete complex workflows. 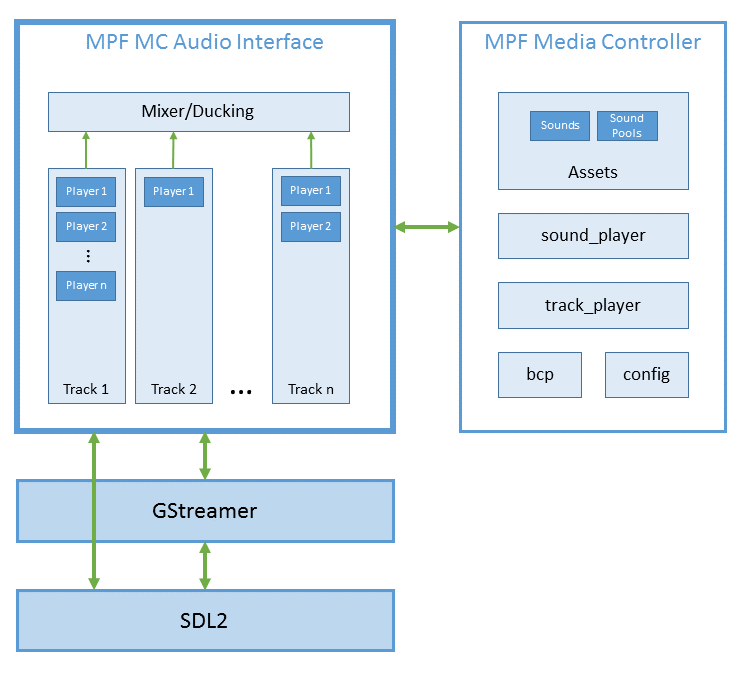 The MPF MC audio interface uses GStreamer for all its sound file loading functions and real-time audio streaming. All audio is fed into SDL2 for final output. The audio interface is divided into tracks, which are analogous to channels on an audio mixer. There are multiple types of audio tracks, each with its own specialized feature set. The output of each track is mixed together and fed to the SDL_Mixer track via the custom music player function. The audio mixing engine uses 16-bit integer calculations and brickwall limiting to ensure there are no numeric overflows (and their resulting distortion). All of the sound generation and mixing functions are C functions (written in Cython) that run in the SDL2 audio thread. It is important to understand the threading models of both SDL2 and Python to avoid common threading problems. Python supports multiple threads, however it uses a mechanism called the “global interpreter lock” (GIL) to ensure that only one thread runs in the Python interpreter at once. This simplifies many low-level details. SDL2 creates its own audio thread in which to receive and process audio data and send it to the audio hardware. As this audio thread is not a Python thread, it does not interact with the GIL and therefore is unable to access any Python objects within its context. This means that only C types and data structures may be utilized in the SDL2 audio callback function; no Python objects can be used. Because the MPF MC is a Python application, a Python extension library is the only choice in which to use the GStreamer, SDL_Mixer and SDL2 libraries. Since the extension library utilizes both Python and C objects, the GIL needs to be managed in the audio library along with thread protection to avoid race conditions and deadlocks. These design constraints led to the choice of using Cython (http://cython.org/) as the language to implement the MPF MC audio library. Cython is a superset of the Python language that additionally supports calling C functions and using C types, an ideal choice for wrapping external C libraries and using them in a Python application. Sounds are MPF assets and are created by the MPF asset loader. The actual sound loading code is contained in the audio library and is performed by SDL_Mixer and GStreamer. A Python container object wraps the C object returned by the loading process. This wrapper allows the sound data to be managed by a Python object. The audio library extracts the C object when necessary and passes it to the audio thread where it can be used to generate audio. The sound_player: enables MPF events to trigger sound actions, such as play, stop, and stop looping. It is a config_player and runs as a plug-in in MPF and also creates event handlers in MPF MC. The audio library also generates MPF events for various sound events (sound played, stopped, looping, etc.) and sends them to MPF via BCP.